Few Westerner's understand the way Eastener's think-particularly Marxist-Leninist Easteners. Anatoly Golitsyn argues that the Soviets/Russians think strategically over decades. Their policy does not shift every election cycle. Their planning is long term. Leaders in Russia are chosen to fit policies. Gorbachev played his chosen role, as did Yeltsin and now Putin. I was shown an example of this long term Soviet thinking when I interviewed a former member of the pro-Soviet NZ Socialist Unity Party some years ago. This man, (I'll call him" Jim"), trained, like most senior SUP members at Lenin's Institute for Higher Learning in Moscow. Jim trained in the early '80s for approximately 12 weeks. 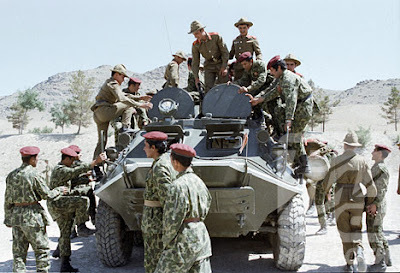 Afghanistan was a still new war then and though progress was slow, the Soviets were doing OK.
Jim and his comrades were taught by their Soviet tutors that the Soviet Union was going to lose the Afghan War. Even more shocking-the Soviets went into Afghanistan, expressly to lose. Why in Lenin's name would they do that? Jim's tutors patiently explained that the Afghan Invasion was part of a larger strategy. The West needed to be convinced of Soviet military weakness and political division. Jim's tutors explained that while the Soviets had the might to pacify Afghanistan in a very short time, that was not the desired outcome. "You see Jim" they explained-"America has had Vietnam, we must have a Vietnam. We must show that we are weak and divided too." Afghanistan was designed show the US that the Soviet Union was not invincible, that she was not to be feared. Cynics would say "well they would say that wouldn't they-they're simply making a virtue of a necessity". I simply point out that this was being taught in 1983. Well before the Soviets were starting to make noises about tossing the towel. Secondly Jim had no inkling of Golitsyn's theories. He was simply a good communist absorbing what he was taught. So if Jim was right, the Soviet Union was prepared to sacrifice hundreds of thousands of lives and billions of roubles for what amounted to a disinformation exercise. What did the Soviets gain by this? I believe Afghanistan was a step on the way to what we have now. The Afghanistan disaster paved the way for the staged "liberalisation" of Eastern Europe and the strategic retreat of communism in the Soviet Union. This in turn led to a neutralist Europe, a wind down of the US arms race and massive Western economic aid for Russia. Now Europe is neutral and NATO is thoroughly infiltrated by the former Eastern bloc. Russia and China are allies again and doing well economically. Russia and China are allied with many of the Islamic nations. Communism is coming back in Latin America, India, South Africa and much of the third world. The US is increasingly isolated and the Eastern Bloc is on the rise. Was this all planned as Golitsyn contends, or is it all an accident of history?